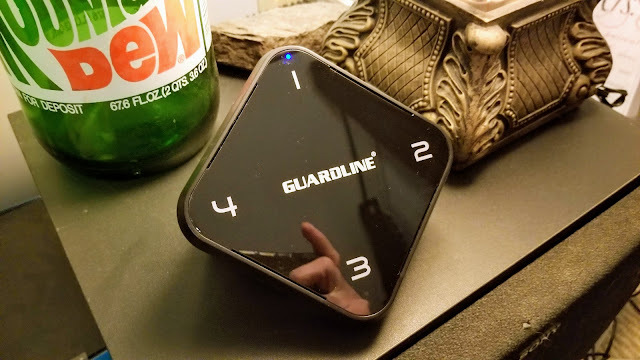 I received the Guardline 1/4 mile range outdoor motion alert to review and was super excited about it. I have 2 sensors, 1 on the driveway and 1 on my gate leading to the back yard. The setup was pretty simple if you read and follow the provided instructions. Basically there's some switches inside the sensor that allow you to setup different distances and the option for daylight or 24 hours a day notification, some people don't want to be bothered after dark or at night. I set mine on the lowest range, which is 14 feet. You can set it to work as far as 1/4 mile away, this way you can setup multiple sensors along your driveway to know how close someone is to your home. The sensor is made of plastic and is able to withstand weather conditions, which for me has mostly been rain. Lots of rain... You are supposed to face the sensor away from the sun to keep it from having false positives, I actually ended up mounting one sensor on the mailbox post at the end of my driveway. 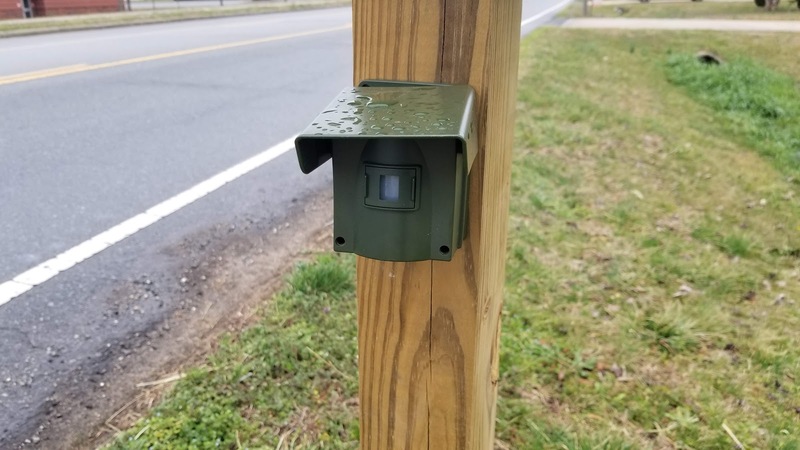 If you don't have a mailbox you could buy a 4x4 post and place it wherever you need to. You'll want to pair the base to the sensor before you mount the sensor. The other option is to mount it and then just takeout the 4 screws and bring the sensor inside your house. You have to the base and the sensor near each other when pairing and the base has to be plugged in to function. I have the base located in the corner of my living room, it's loud enough that I can hear it upstairs if the TV up there isn't on. I definitely give the system five stars, it does exactly what it's designed to do. For example, I have my Alexa remind me to place our dog in his crate before my wife gets home from work. When I do forget I get a notification when she pulls in the driveway. Of course the main function is to alert you when anyone pulls in your driveway, which it does flawlessly. My base plays a different notification if someone passes by the sensor I have mounted by the side gate, where no one should be. For the cons I gave here I'm really grasping for straws. They're probably more like "nice to haves", Guardline may even have some of these in development. It would be really nice to receive a notification on your smart phone when someone passes a sensor, that way when you're in a different part of the house or in the back yard you would still get a notification. The other option for inside the house is to buy another base and place it wherever you need it. Want to leave a comment? Click on the article title and scroll down. $239.99 for 4GB/32 GB Version - This is the version I have. At first glance you may be asking yourself, "Self, what would I do with a PC this small?" Let me tell you, there's actually a lot you can do with this small PC. It would make a great HTPC. You could load up Plex and stream your favorite movies from another PC. You can stream popular services like Netflix, Hulu, and Amazon Prime. You can even stream movies from Microsoft's Store. The one thing you won't be able to do is stream any graphic intensive games. The version I received to review came with 32 gigs of storage. Now to be honest with you, there' not a whole lot you can store on it with 32 gigs. You'll still be able to browse the web and visit your favorite social networking sites like Facebook and Twitter. You'll want to utilize the built in SD card if you want to store pictures or videos. 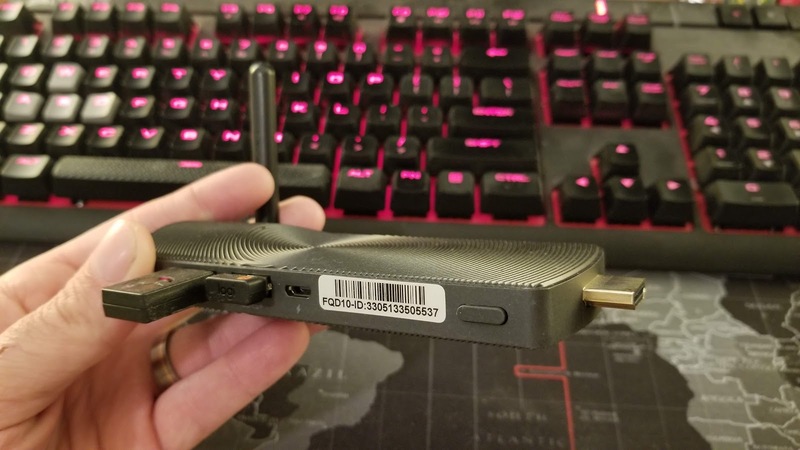 One of the nice features of this small computer is that it'll connect to a monitor with HDMI or VGA. Even many of the newer graphics cards won't connect with VGA anymore. This is great if you have a spare monitor lying around. This little PC also support streaming 4k at 60fps, which is great. 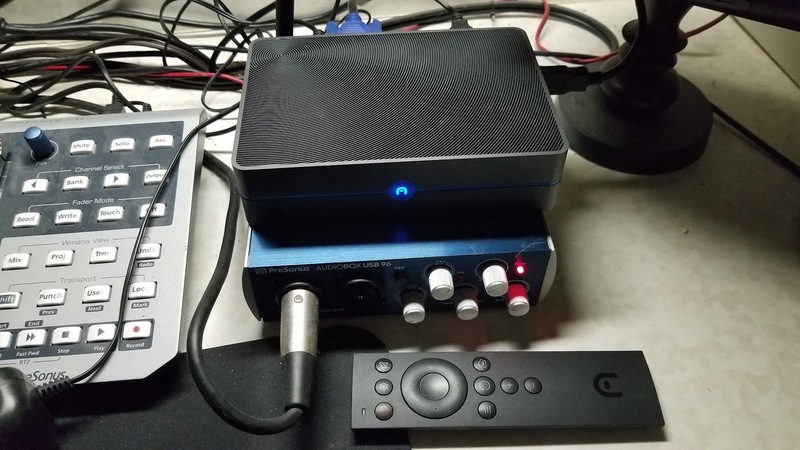 Since you have 3 usb 3.0 ports, you can even turn this small little PC into a small media server to serve music or movies. This small PC is even fan-less, which means you won't here any of that horrible fan noise. Like any PC you'll need to purchase a keyboard and a mouse, or you can just purchase a combo that has both. This is great if you're using it as a HTPC. So you may be asking yourself, what can you do with the remote. The remote lets you power the computer on and off, change the volume, mute the computer, and switch tabs. There's no way to actually navigate the page, for that you'll need to use a wireless mouse. The small PC boots up quickly and is running Windows 10, which is nice and means you'll have all the latest security updates. I loaded up the Chrome browser, Hulu, Netflix, and Pluto TV. All these services ran just fine. I have the small PC hooked up to a screen at my kitchen desk, which was great because it was VGA. The is going to be a great little second computer and I have enjoyed it so far, so if you're looking for a small, lightweight second PC, I'd definitely give this one a look. I have been using Dollar Shave Club for a while now and definitely saved a lot of money on blades compared to store brands, you may remember my post about them. I can't remember if I was Googling something or if I ran across it on Facebook or YouTube, but I saw or read about someone using a double edge razor. I then searched YouTube about double edge razors and some of the YouTubers mentioned how close of a shave you can get without irritation. I've always had issues with razors giving me irritation, usually on my neck, sometimes it would be worse than others. Because of this I typically would only shave about twice a week, sometimes I would go even longer between shaves. I was under the impression, like most people, that safety razors were dangerous. But they are not, that's why they're called safety razors. It was a safer alternative to the straight razor. You typically get skin irritation due to the amount of blades raking across your skin on a razor cartridge. Razors cartridges now days have 3, 4, or even 5 blades on them. A double edge safety razor only has 1 blade with 2 sides. I can usually get 3 to 4 shaves from a blade and shave every other day. I had to replace the Dollar Shave Club cartridges once a week. 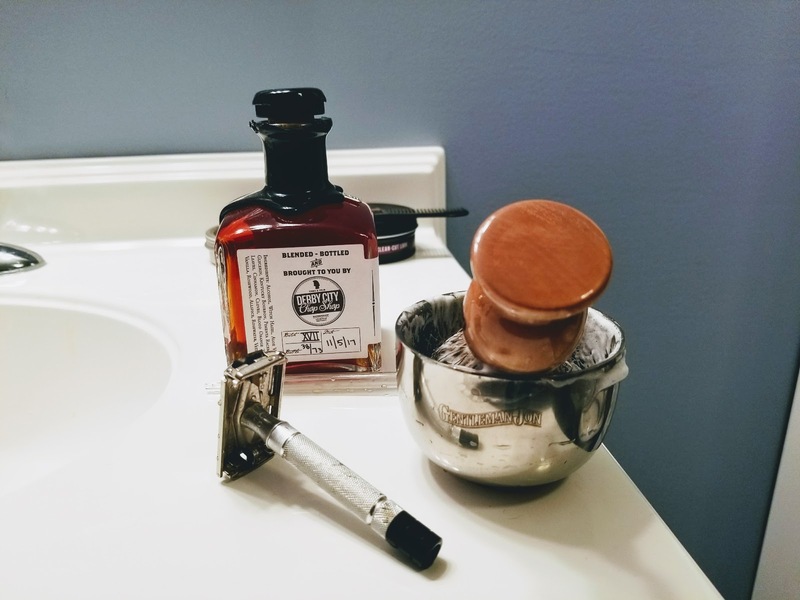 I bought my first double edge razor kit from Amazon, it's called the Gentleman Jon complete shave kit. It includes a razor, 5 blades, a badger hair brush, a shave soap puck, and a stainless steel bowl. You get all that for $55. I know what your thinking, "That's a lot of money!" The thing is, you only buy most of this stuff once. The only 2 things you need to replace are the soap pucks and razors, but not very often. You can get 100 razors for around $10 and soap pucks for under $10. The Gentleman Jon razor wasn't too bad, but seemed a little abrasive to me. A few weeks later I purchased an old 1950s Gillette black tip and red tip razor. From what I read on the internet, the red tip was suppose to be a little more aggressive. To me the black and the red tips have a similar feel when you shave. You can purchase these razors for around the $20 mark on eBay, which is outstanding. Once you purchase a couple razors you should be set for a long time. There are also different types of aggressiveness for the blades. I purchased the Astra Superior Premium Platinum Double Edge blades on Amazon.com for $10.99. That's right at 11 cents a blade. So not only do you get a better shave and less irritation, you save a ton of money. The next set of blades I'd like to try are the Personna Double Edge Razor Blades, 100 for $12.45 on Amazon.com. If you're not sure which blades you'd like to get, you can buy variety sampler pack and try different ones. There are different types of brushes as well. There's badger, boar, horse, and synthetic for you PETA fans. Boar is the most aggressive and the most popular is badger, which is less aggressive. I haven't seen much talk about horse hair, but purchased one from Target from a company called Cremo (You may have seen me mention them in a past post). The horse hair brush is by far the softest one I have, but I only have a badger and horse hair brush. Now that we have all the products sorted, lets talk about the preparation and order. 1. The first thing you'll want to do is run some warm water into your shaving bowl and place your brush in the bowl. You should wait a minimum 5 minutes before you start shaving, this allows time for the brush to soften up. You can also let it soak while you take a shower (this is what I typically do). 2. Once you're out of the shower you can start making the shaving foam. What I do is squeeze some of the water out of the brush and start swirling it around on the soap in the soap bowl or container. You'll want to do this until you get a good foam lather. If you can't figure this out there's a lot of good YouTube videos on how, it doesn't take long at all. 3. Now you'll want to lather up your face. I will usually splash my face with warm water first, then brush the foamed shaving soap on. Be sure to cover everywhere you want to shave. 4. Now start the shaving process. You'll want the weight of the brush to do most of the work, so don't go pressing the razor hard against your face, gently pull it down. You'll want to go with the grain of your facial hair if you have sensitive skin (like me). Remember that you have 2 sides of the razor to use, and you can rinse the soap off the razor while shaving. Once I complete a full pass on all of the hair on my face I will soap up my face again and make a second pass. If your face isn't as sensitive as mine you can even make a third pass against the grain for a buttery smooth shave. 5. Now that your done you can rinse your razor and brush off in the water. I then place mine on the stand I purchased on Amazon. This allows the brush to dry out and not have any fowl odors. I know what your thinking, this sounds like it's a task and it takes a long time to shave (this was my assumption as well). I assure you that's not the case. You can complete the steps above in under 5 minutes. You'll be surprised how smooth the shave is and how you have less irritation. I was like "Why didn't I find out about this sooner?" I am now hooked. The watch that got me started, my Bulova. That's St. Maarten in the background. I just recently started collecting watches after buying a Bulova when I was on my honeymoon cruise in St. Maarten. I never would have thought buying one automatic watch would lead me to collecting. I'll have to admit, I've had a few watches over the years. Some cheap, the more expensive one's were the Fitbit's and smart watches (still cheap in the watch world). I thought I'd share my knowledge that I learned about watches in the short time that I've started collecting. 11 watches later I think I have a problem, lol. I know what your thinking, a watch just tells time. But there's more to it than that. It's kind of like owning a car, a watch can show your personality and tell a lot about you. Let me start off by going back to what got me into wanting to collect watches. Like I said earlier, I bought my first "expensive" watch in St. Maarten. It was a quick decision and I didn't have much time to look for anything super specific. I just knew I wanted to get a decent automatic watch since it was my honeymoon. At the time I didn't know anything about watches and didn't know anything about the brand Bulova. Luckily, Bulova is a great brand with some great history. They are currently owned by Citizen, another great Japanese watch brand. Luckily I didn't fall for any fashion watches or Invicta (we'll get into that later). So after I came back home from my honeymoon I started doing some more research about some of the different watch brands, what makes a good watch, and what not to buy. So basically you have two different types of watches, fashion watches and luxury watches. Luxury watches can even be broken down into several different price points, budget $20-$100, low $100-$500, mid $500-$1000, mid-high $1000-$3000 and high $3000 and up. Luxury watch prices really depend on several factors. The movement, crystal, and type of watch. For movements (the part that actually keeps time, in other words the internals) you have quartz (battery and solar), automatic (your wrist movement keeps the spring wound), and mechanical (you have to manually wind them) watches. For the crystal (the glass portion of the watch) you have acrylic (fancy word for plastic), mineral (more scratch resistant than acrylic, and sapphire (almost as hard as diamonds but they can still scratch). For the types of watches you have dive, dress, racing, aviation, and field watches. Each of those served a purpose at one point or another, but many people just purchase the specific style they like. Now I'll break down a few brands that fall in each of the luxury price points (note that each of these brands may have watches above or below these price points). From $20-$100 we have the Timex and Casio brands. $100-$500 we have Seiko, Orient, Citizens, and Bulova. In the $500-$1000 we have Hamilton, and Glycine. $1000-3000 we have Oris, Longines, and Maurice Lacroix. $3000 and up we have Tudor, Breitling, Omega, and Rolex's. If you want really expensive just search for some Phillipe Patek watches. I almost forgot to mention micro brands. Micro brands are small startups that typically use Swiss or Seiko movements. Many times they will be made in China with the headquarters being outside of China. Their quality control is usually better than your fashion watches. Some micro brands include Jack Mason, Spinnaker, Dan Henry and many many more. This is one of the quickest watch growing segments. 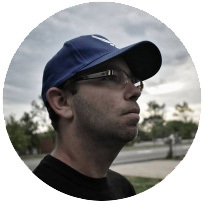 Sometimes you'll see micro brands in crowdfunding campaigns or kick starters. There's nothing at all wrong with owning a micro brand watch. The other great part about luxury watches is that most brands have great horology history and have been innovative throughout the years with different features. For example, Rolex was the first to have a waterproof watch in 1926, the first watch with auto changing date in 1945, and the first to show 2 time zones. The Bulova Accutron watch was the first to use a tuning fork instead of a balance wheel as the timekeeping element in 1960. The Omega Speedmaster was the first watch to go to the moon in 1969. Seiko was the first to create a quartz watch in 1969 (which almost took out the mechanical and automatic watch industry). Casio introduced a rugged watch called the G-Shock in 1983. Timex patented a technology used to light up the watch dial with the touch of a button called Indiglo in 1992. Oh, did I mention luxury watches hold their value? Fashion watches have many price points as well, the really big difference is price and only price. Fashion watch brands are more about making the most money they can for themselves. They typically have poor quality control, cheap movements, and are made in China (there are a few decent Chinese watch companies). A few fashion or designer brands include DW (Daniel Wellington), Guess, Fossil, Diesel, MVMT, Gucci, and Movado and so many more. I'd recommend staying away from these brands. So you wonder how they sell so many you ask? They have a great marketing campaign and are really good at social media. They get big name persons to promote their products. Oh, you thought I forgot about the Invicta watches. So what gives Invicta such a bad name? They do have a great history. Well for starters, they really markup their MSRP. Just go to Amazon.com and search for a Invicta watch. You'll see MSRPs for $1200 and the watch selling for $200. Don't get me wrong, the $200 watches are probably worth $200. They also produce some of the largest and gaudiest watches around. Some people are into those types of watches, which is why they don't have a problem selling them. I think some of their dive watches are pretty good. I did get a good deal on a Invicta Lupah watch on Ebay, what can I say, I like the looks of them. I still think Invicta watches are better than fashion watches. For me, I buy watches I like. You have some people that are really into dive watches or dress watches... etc. I've already purchased a couple Citizens, a Seiko, a Hamilton, a Dan Henry, and Jack Mason just to name a few. Some watches that are on my future list include Oris, Omega, and possibly a Rolex (pretty far out at this point). Each watch has it's own personality. I have 2 beater watches that I wear most of the time, these are watches that I'm OK with getting a little beat up. One's a Citizen and the other is a Spinnaker. So get out there and buy you a quartz, automatic, or mechanical watch. I'll possibly be doing some watch reviews in the near future, so stay tuned. A rep from Azulle asked me if I'd like to review a new computer stick that is coming to the market. I've came so close to buying one more than once, so I jumped at the opportunity for the review. The whole idea behind Azulle is to replace those big-ol clunky towers with smaller,m palm size PCs that work just as good, if not better. Not only can you use them on a computer monitor, you can plug them up to your TV as well and they are super portable. It is larger than a typical USB stick, but it's still way smaller than a typical PC. So the version I tested was the Azulle Access3 Windows 10 Fanless Mini PC Stick that features the Gemini Lake N4100 processor, which make this thing fast. I tested it connected to a 55" Vizio TV in the bedroom. The only accessory that you'll need to buy is a keyboard with built in mouse so that you can type and navigate. It would be nice if they offered a version that included a way to interact with PC. I purchased the Logitech K400 keyboard at my local Walmart for $20, it has a built in touch mouse. The other advantage of the Logitech keyboard is that you do have the option to put the Azulle computer to sleep with the touch of a button. This can be a fun little stick PC. It's not going to play the latest and fastest PC games, but it can handle some smaller Steam and Windows Store games. I loaded up Atari Vault on Steam and it was able to play just fine, I even connected my Steam controller to the Azulle stick without any issues. If you have an Ethernet cable close to your TV you'd be able to stream your PC Steam games to this little stick. Along with games, you can browse the internet, watch YouTube videos, Netflix, Hulu, Amazon Video, and Windows Movies. Unlike a Roku, Amazon Fire TV device, or Apple TV, you can multitask with the Azulle PC stick. You can finally work on your Word or Excel documents from your couch! Did I mention this little stick supports 4k? Well it does! Unlike other PC sticks, you get 2 USB ports with this one. This means you can add a microphone to use Cortana, or a camera with built in microphone to use Skype or other services such as Facebook Messenger. I used the USB port for the keyboard and Steam controller, you can use Bluetooth devices as well. If you're looking to add a second computer or need a computer stick for your TV, I'd definitely take a look at the Azulle Computer stick. You can find the 32 GB and 64 GB version of the computer stick at Amazon.com. They also sell other variations at Walmart, Best Buy, B&H Photo, and Adorama. This would also make a great gift for the holiday season, a little birdy told me these will be on sale on Black Friday.